Facebook Mutual Friend with the Ex’s Girlfriend? – Part One | Just Me With . . .
On an extremely rare holiday downtown shopping trip with my sisters, I had a chance meeting with a guy while looking for a parking spot. We had asked him if we could take his spot as he was about to pull out. He was reasonably attractive and had a law school sticker on his car. So I (also a lawyer) thought, “ I’m going to be forward and strike up a conversation.” I found out that he was an associate with the very same law firm I had worked for in a previous life. (This was an amazing coincidence since he is African-American also and there have been very few attorneys of color employed at this firm.) He was friendly, seemed nice and let’s face it – good on paper. I asked for his card. Oh, and did I mention that he appeared to be at least 10 years younger than me? It took me two whole months to get the nerve to email him. When I did, he remembered me right away. It was just the ego boost I needed. We went out. Long story short, I knew him in the Biblical sense (in hindsight, probably too quickly) . I wasn’t emotionally equipped to build a relationship and didn’t know how to date. Plus, I had no time what with all those people I had made over the years (the kids). And, I was still a wreck. It was a struggle to maintain the face of normalcy for extended periods of time. I couldn’t or wouldn’t do the fun activities he suggested we do –so it kind of became a very short-lived — arrangement. But I had met my secret goal: I had been with a man, not my husband, who had not ever known me as someone’s wife. It didn’t hurt my self-esteem either, that after five kids and a nervous breakdown, I was able to snag, albeit briefly, a younger man who would have been “a catch” for any woman. It was what I needed at the time. So when it fizzled with him, it was okay. He’d been my — my Transitional Man. Fast forward a couple of years. The Ex announces he has a girlfriend now (he’d had them before but this time he was bringing one around the kids). So I did what every woman with a computer and internet access would do – I electronically stalked — I mean — researched her. First stop? – Facebook. Success. I now knew what she looked like, what her hobbies and interests were, and that she was 10 years younger than me. Seeing her picture didn’t bother me. But as I scrolled down I saw something that did bother me. We had one mutual friend. ONE MUTUAL FRIEND. Not my Ex, of course not. I’m not his friend on Facebook or anywhere else. No, our mutual friend was my Transitional Man!!! Aha! That’s why her page yielded so much information. You see, most of the Girlfriend’s entries were accessible to me because I was a “Friend of a Friend.” Hmm. But then I realized that the”Friend of the Friend” stuff works both ways. Most of my settings were already “Friends Only” (I had a stalking issue I’ll blog about later) but just to be safe I took down pictures and personal information. It wasn’t long before the Girlfriend changed her settings to “Friends Only ” — meaning she’d probably looked at my page and discovered our Mutual Friend as well. The real issue, however, remained — One Mutual Friend. I told myself that since The Girlfriend and my Transitional Man graduated college the same year maybe they knew each other from some professional group, even though she’s not a lawyer. 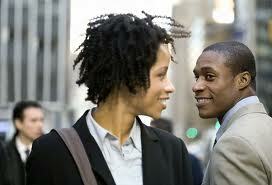 The voice in my head was screaming WHAT IF THE GIRLFRIEND WENT OUT WITH MY TRANSITIONAL MAN TOO? I mean, that would just be wrong on so many levels. I tried to dismiss the thought from my consciousness. How unfair and sick would that be? My chance, movie-like meeting with my good on paper Transitional Man—and maybe he’d been with The Girlfriend, too?– Ew. That would be way too much exchange of DNA in a small world with not nearly enough degrees of separation. In short, it was just freaking me the hell out. And this is not a small town, mind you. We live in a large metropolitan area. What the hell? Yet I could find no common ground – school, work, etc. between the Girlfriend and my Transitional Man that would administratively explain their Facebook friendship. I resigned myself to leave the question unanswered. Transitional Man and I sometimes exchanged Facebook pleasantries (I “liked” his new “in a relationship” status) but I did not think it appropriate to approach him and ask. A few months later (and after Transitional Man’s relationship status was back to being single), I got a text out of the blue from him about some law stuff. We chatted and had the “let’s catch up” conversation. I agreed to have coffee with him. (I hadn’t seen him since our last “date”). Since Transitional Man initiated the meeting, however, I thought it now appropriate to ask him ever so casually, while sipping over-priced coffee at Starbucks, about how he knows his Facebook friend — the Girlfriend. Just Me With a Question: So, how do you know [the Girlfriend’s name]? Transitional Man’s Answer: Oh. Yeah, I’m not that good friends with her but I’m really good friends with her cousin. And [Ex-Husband’s New Girlfriend] and I went out a couple of years ago. In case it is in any way unclear: My Transitional Man had dated my Ex–Husband’s New Girlfriend. Postscript: By the way, The Ex and the New Girlfriend are married now. Postscript: The Transitional Man is married now. Postscript: I am single. I am quite contentedly single.